The UT System Board of Regents voted Friday to select Greg Fenves, UT executive vice president and provost, as the sole finalist to become the next UT president. If approved, Fenves will replace outgoing President William Powers Jr., whose relationship with the Board has been tumultuous for the last several years. The Board must wait 21 days before making an official appointment. Fenves came to UT as a civil engineering assistant professor in 1984 and served as dean for the Cockrell School of Engineering from 2008 to 2013. In his capacity as provost, Fenves has been responsible for academic, research and curriculum affairs, as well as resource allocation for faculty recruitment. Working with deans and other academic officials, Fenves also oversees planning and operations for libraries, museums, collections, and research centers. Sharon Wood, who succeeded Fenves as engineering school dean, said she first met Fenves when he was a faculty member at the University of California-Berkeley nearly 25 years ago. “I was very taken aback at his very strong vision. He articulated it very well — where he wanted the department to go and what targets they had,” Wood said. Since his appointment as provost in October 2013, Fenves has worked closely with Powers on a variety of University initiatives. At Friday’s meeting, three of the regents who have been most vocal in their criticism of Powers — Wallace Hall, Alex Cranberg and Brenda Pejovich — all voted against Fenves. Board Chairman Paul Foster said he felt the dissenting voices speak well to the Board’s decision-making process. Former Sen. Kay Bailey Hutchison, president of the Texas Exes, said the selection committee favored Fenves after it interviewed him for the president position. Fenves was one of three main candidates in the search, alongside current UT-Dallas President David Daniel and Oxford University Vice Chancellor Andrew Hamilton. Hamilton, who was widely reported to be the front-runner, announced he was taking a position as president at New York University early last week. Wood said she knows Fenves has a strong work ethic, as demonstrated by his early rising habits. In light of budget shortfalls in the state government, Jefferson Coombs, executive director of the Cal Alumni Association, said Fenves would be able to provide strong support for continued funding at UT. “At this time when public research universities face a lot of challenges in terms of funding from the state, I think he’s a fantastic advocate for the impact and the power and the importance of public higher education,” Coombs said. Coombs said he believes Fenves will continue and build upon Powers’ goal of maintaining clear lines of communication with the UT community. “I really get the impression that he is going to not just maintain strong dialogue with students. I get the impression that he wants to expand it and that he is very personally enthusiastic about the connection with students,” Coombs said. As provost, Fenves has helped lead the effort to launch the Dell Medical School and greenlight construction on the Engineering Education and Research Center, a $310 million, 430,000-square-foot building dedicated to research and student projects. The building is slated for completion in 2017. Fenves serves on multiple committees at UT, including the Dean Search and the Dell Medical School Steering committees. He has also received numerous national awards, including the Presidential Young Investigator Award from the National Science Foundation, and from the American Society of Civil Engineers, the Walter L. Huber Research Prize, the Moisseiff Award, and the J. James R. Croes Medal. According to the meeting agenda, the Board of Regents will meet in an executive session to discuss candidates to replace President William Powers Jr., who will step down in June. The meeting will be reopened to the public at 4 p.m. to consider action, if any, on executive session agenda items. The names of the presidential finalists are expected to be released in March, according to a timeline published on the UT System’s website. The UT System Board of Regents will meet Wednesday to discuss the search for UT’s next president. President WIlliam Powers Jr. will step down from his position in June. SB 175, a bill originally passed in 2009, modified UT’s admissions structure to limit automatically admitted students to 75 percent of a given class. It also provided a mechanism for automatic transfer admission, so students who are admitted into the University in the top 7 percent of their class have the option to attend a community college for up to two years and then come to UT, given they complete a certain portion of their degree plan and maintain a minimum GPA of 2.5. Powers said he felt that student-veterans were left out of the plan outlined by SB 175. Powers said the bill outlines a clear path for community college students who are qualified to attend UT, but generally does not allow for an admissions timeline amenable to the military experience. “I think it was geared toward the community college experience, whereas many veterans will go in for a four-year hitch, come out and they don’t fall into that provision,” Powers said. Linguistics graduate student Lauren Terzenbach said she thinks the same protections should be extended to student-veterans as those that are provided for veterans who leave the work force and return after serving. “It’s the same for a job that has to be held for a [National Guardsman] or reserve soldier if they’re deployed. Why wouldn’t education do something similar?” Terzenbach said. Powers told regents he is currently working on the issue of how to classify returning veterans who were automatically admitted. Powers said returning student-veterans are classified as transfer students, but under a new plan, they would retain their automatic admissions status, going in the same pool of other automatically admitted students when they return to UT. Regent Alex Cranberg said he agreed with Powers that the returning veterans, who were automatically accepted to UT from high school, should be counted with the 75 percent of an entering class that is automatically accepted. This would allow more room for students to be accepted under the holistic admissions process that the other 25 percent of the class is admitted through, he said. “I think that if we come up with a solution which, if implemented, will fully address the problem and concern that we’ve talked about — that the transfer latitude seems to be the appropriate way of still preserving veterans’ auto-admit rights while allowing the University to be able to fully deploy its 25 percent toward holistic admission,” Cranberg said. Powers praised the school of journalism’s faculty and said the school’s diversity and vitality are due mainly to the leadership of its professors. “In the future, we will maintain a … journalism education [that emphasizes] not only the ‘how’, but also the ‘why’ and the ethics and the way of going about getting the truth,” Powers said. 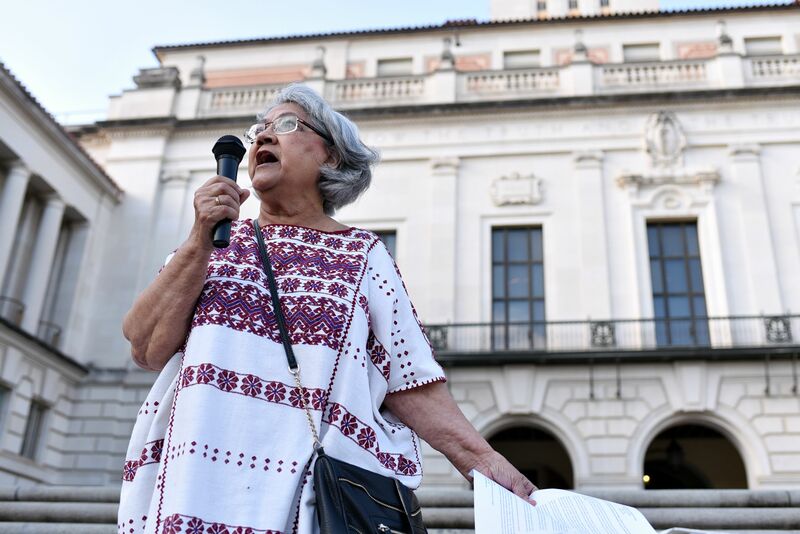 At the event, Powers praised State Senator Judith Zaffirini, D-Laredo, whom he referred to as “our BFF.” Zaffirini, who received her master’s degree from the college in 1970, sits on the Senate Higher Education Committee and has been vocal about her frustrations with the conduct of current members of the UT System Board of Regents. In her speech, Zaffirini said Powers has had a positive impact on the University and on the journalism school in particular, but said she was aware others did not share that view. “I wish all the members of the Board of Regents felt the same,” Zaffirini said. “A journalist’s job is providing the truth, and telling the truth, and telling it right, and digging deeper, and asking unpleasant questions and pushing a little bit harder so that the rest of us can all profit from an enlightened democracy,” Hart said. Journalism sophomore Dylan Samuel also said that he is proud of what the school of journalism has accomplished within the past hundred years. UT President William Power Jr. was named the University of California, Berkeley’s Alumnus of the Year for 2014. Powers received his undergraduate chemistry degree at the UC-Berkeley in 1967. According to UC-Berkeley’s website Powers was honored with the position for his experience as a Navy veteran, editor of the “Harvard Law Review,” legal consultant to the U.S. Congress and the Brazilian Legislature as well as his role as UT president. Powers joins various other UC-Berkeley professors holding the Alumnus of the Year title.